Follow in the footsteps of Argentinian travellers to the northern region of Salta, dotted with an eclectic mix of churches, adobe houses and Inca ruins, and largely unchartered as of yet by foreign tourists. Feel like you’re being let in on a local secret as you step inside La Merced del Alto, in the heart of the Calchaquí Valley. Built as a traditional manor house with wide interior patios and tall galleries, La Merced del Alto is a beautiful reflection of its rustic surroundings in the heart of the Argentinian countryside. Feel inspired by the bright interiors that mirror your colourful mountain setting. 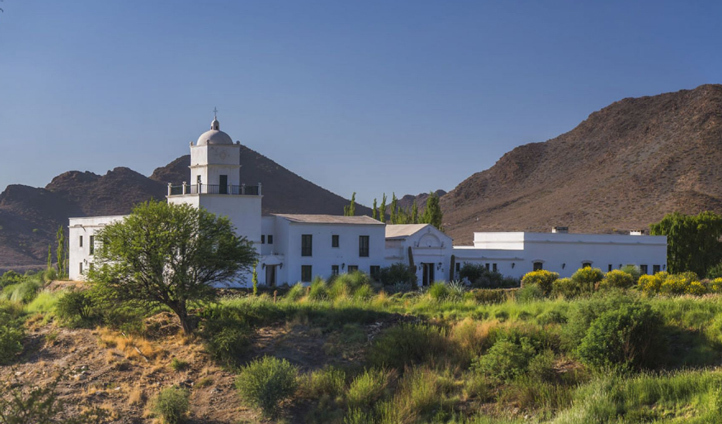 Under three hours from Salta International Airport, this is a remote countryside setting beyond your wildest dreams. The breath-taking views invite you to explore Calchaquí Valley on your doorstep. Just two kilometres away is the charming colonial village of Cachi, set in the midst of breath-taking scenery. Known locally as ‘the city,’ you’ll soon realise just how remote and unspoiled this part of Argentina is. Overlooked by the noble mountain network of Nevado de Cachi, the few cobbled streets and quaint plaza are just the right amount of civilisation for this region. With 13 deluxe rooms and one Suite, La Merced del Alto prides itself on personalised service to ensure your stay is as exclusive and enjoyable as it could possibly be. We love the refreshing flagstone floors in each palatial room, cooling you down after an afternoon relaxing by the pool like a royal. Visit a local weaver’s workshop after breakfast and spend the afternoon exploring the high-altitude vineyards of Cafayate before returning for an early evening hydro-massage followed by a glass of bubbly in the open air Jacuzzi. The silence is a perfect soundtrack while you reflect in the peaceful backdrop of mountains and blue skies.